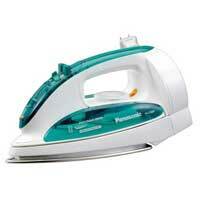 With powerful steam, this Panasonic iron gets wrinkles out quickly and easily. We were curious to see how well the retractable cord works, and we didn’t experience any trouble with it. By pushing a button the cord automatically winds up inside the iron’s housing, making the iron easier to store. The detachable water tank has anti-calcium system that prevents buildup. Easy to wield but heavy enough to press out tough wrinkles, the Panasonic iron, available for $32.95, heats up quickly and moves smoothly over fabric.